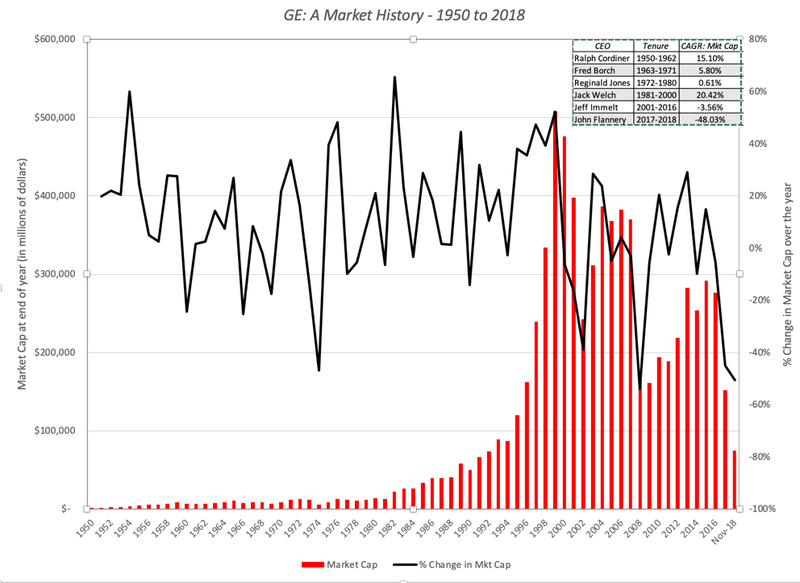 It seems like ancient history, but it was just 2001, when GE was the most valuable company in the world, commanding a market capitalization in excess of $500 billion. The quintessential conglomerate, with a presence in almost every part of the global economy, it seemed to have been built to withstand economic shocks and was the choice for conservative investors, scared of the short life cycles and the volatile fortunes of its tech challengers. 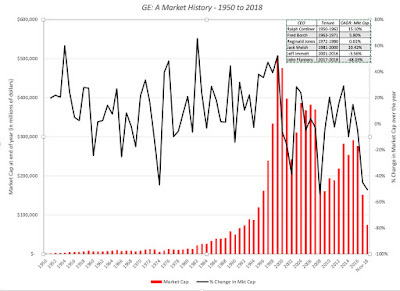 Unlike other aging companies like Sears that have decayed gradually over decades, GE's fall from grace has been precipitous , with the rate of decline accelerating the in the last two years. As a new CEO is brought in, with hopes that he will be a savior, it is the right time to both look back and look forward at one of the globe's most iconic companies. GE's roots can be traced back to Thomas Edison and his invention of the light bulb. The company that Edison founded in 1878, Edison General Electric, was combined with two other electric companies to create General Electric in 1892. The company established its first industrial lab in 1900 and it would not be an exaggeration to say that it revolutionized not just the American home, with its appliances, but changed the way Americans live. For much of of the twentieth century, though, GE remained an appliance company, though it made forays into other businesses. It was in 1980, when Jack Welch became the CEO of the company, that the company started its march towards what it has become today. 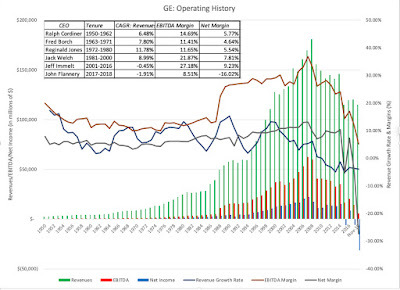 Today, GE is in three businesses (aviation, healthcare and transportation) that have low growth and high profitability (margins and returns on capital), in three energy-related businesses (power, renewable energy and oil) with higher growth but low profitability (margins & returns on capital), one business (lighting) that is fading quickly and one (capital) that is declining, but dragging value down with it. Note also that the collective profits reported across businesses is before corporate expenses and eliminations of $3.83 billion (not counting a one-time restructuring charge of $4.1 billion) that effectively wipe out about half of the operating profits. When computing return on capital, I allocated these expenses to the businesses, based upon revenues, and used a 25% effective tax rate, and while GE as a whole did not deliver a return that meets its cost of capital requirements in 2017, aviation, healthcare and transportation clear their hurdle rates by plenty. 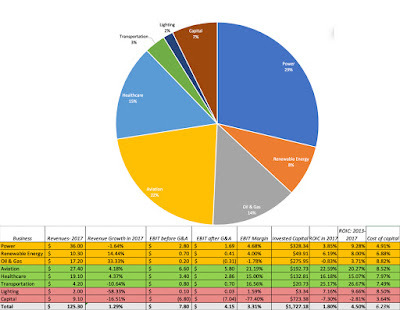 Replacing 2017 income in each business with a normalized value (computed using the average margins in each business between 2013 and 2017) improves the return on capital at the power and renewable energy businesses, but the overall conclusion remains the same. GE, as a company, does not look good, but it does have significant value creating businesses. 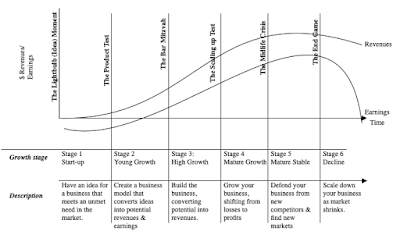 While there are different ways of framing GE's current standing, I will use the corporate life cycle, since it encapsulates the challenges facing the company. GE's light bulb moment might have been in Thomas Edison's lab in 1878, but at an official corporate age of 126 years, GE is an ancient company and its problems reflect its age. Other than renewable energy, all of GE's businesses are mature or declining, and by the laws of mathematics, GE itself is a mature to declining company. Any story that you tell about GE going forward has to reflect this reality, and there are three possible ones that can lead to different values. 1. 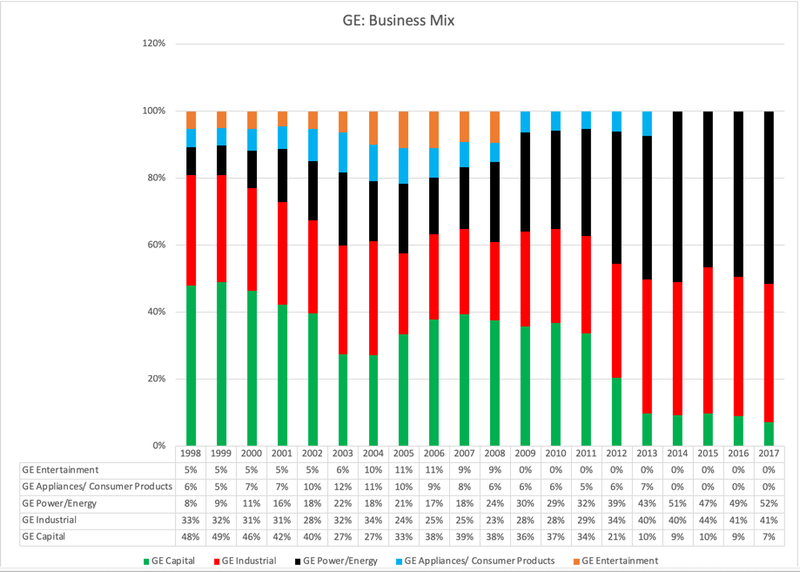 Break it up: If GE at its peak represented the glory of conglomerates, its current plight is a sign of how far conglomerates have fallen in the world. Across the world, multi business companies are finding themselves under pressure to break up and in many cases, their stockholders will be better off if they do. To gain from a break up, though, here are some of the things that have to be true. Separable businesses: The different businesses have to be separable, since leakages and synergies across businesses can make it more difficult to cleave off pieces to sell or spin off. 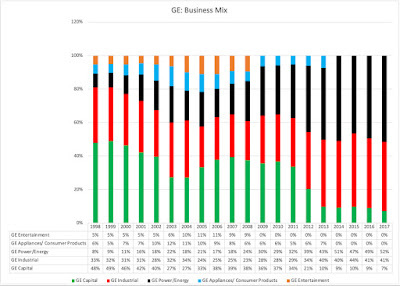 On this count, GE is probably on safe ground, since its businesses (other than GE Capital) are self standing, for the most part, with little in terms of cross business effects. Willing buyers: There have to be potential buyers who are willing to pay prices for the pieces that exceed what they will generate as value for the holding company, as going concerns, and those higher prices either have to come from potential synergies or changed management. None of GE's businesses seem alluring enough to attract multiple bidders, willing to pay premium prices, and given GE's shaky bargaining position, it is more likely than not that a rush to unload businesses will do more harm than good. Corporate Waste (at HQ): A large chunk of the corporate overhead has to viewed as wasteful, with a big drop in corporate expenses accompanying the breakup. How much of the corporate expense of $3.8 billion that GE reported in 2017 is wasteful and could be eliminated with targeted cost cuts? Looking at the breakdown of these expenses, just about $2.2 billion in for covering pension obligations and breaking up the company will not relieve the company of its contractual obligations. Some of the remaining $1.6 billion may be fat that can be cut, but even cutting the entire amount (which would be a tall order) will not turn the company around. 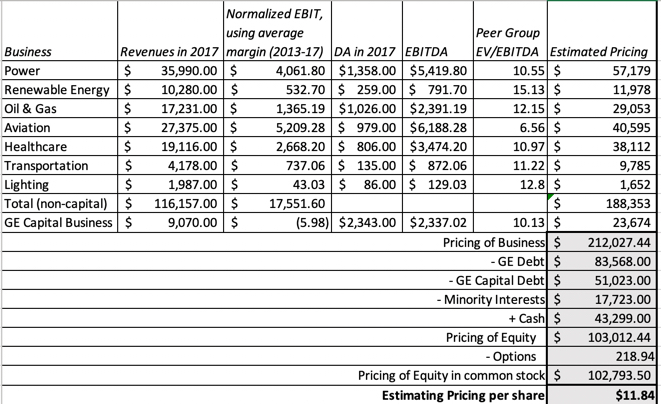 If GE is able to get buyers to pay industry-level multiples of EBITDA for each of these businesses, it will be able to net about $103 billion for its equity investors, higher than the market capitalization on November 14 of $72 billion. The problem, though, is that fire sales of entire companies almost never deliver the expected proceeds, as buyers, recognizing desperation, hold back. In fact, GE's attempts to extricate itself from a portion of its Baker-Hughes investment in the last few days show that these sales will occur at a discount. The value that I derive for equity is lower than the $103 billion that I estimated in the last section, but it does not require any near term fire sales at discounts. There are two big challenges that GE will face along the way. The first is that GE is saddled with a significant debt obligation, a legacy of GE Capital, that will not fade away quickly, and the debt obligations represent a clear and present danger to the firm. 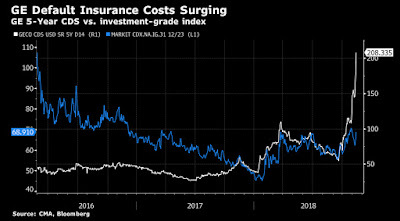 One reason for the rapid drop in GE's stock price in the last few weeks has been the deterioration in the company's credit standing, as can be seen in the rising default spreads for the company in the CDS market. The reason that GE is trying to sell some of its stake in Baker and Hughes to pay down debt, but bond markets are skeptical, with good reason. The second is that GE Capital is now more burden than benefit to investors. In the valuation table, note that the value that I have estimated for GE Capital's operations ($27 billion) is much lower than GE Capital debt ($51 billion); in fact, I derive very similar results in the pricing. Put differently, in my valuation, I foresee the cost of exiting GE capital to be $24 billion in today's terms, but spread out over time. 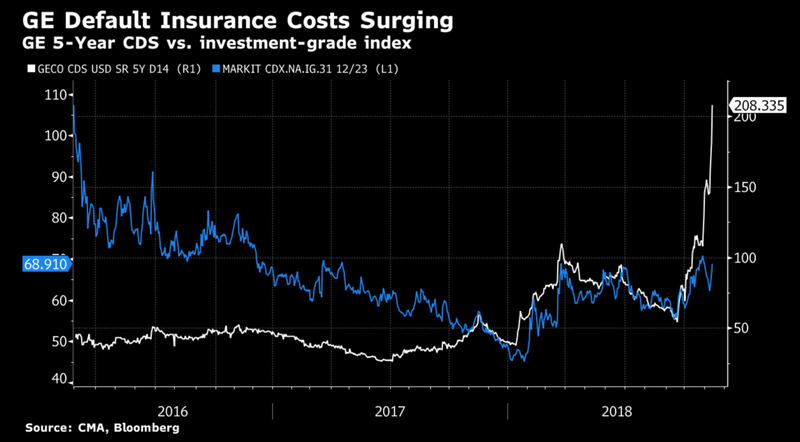 If GE can navigate its way through its debt payments to becoming a more focused company, with constrained ambitions, it could survive and reclaim its place as a holding for a conservative value investor. 3. 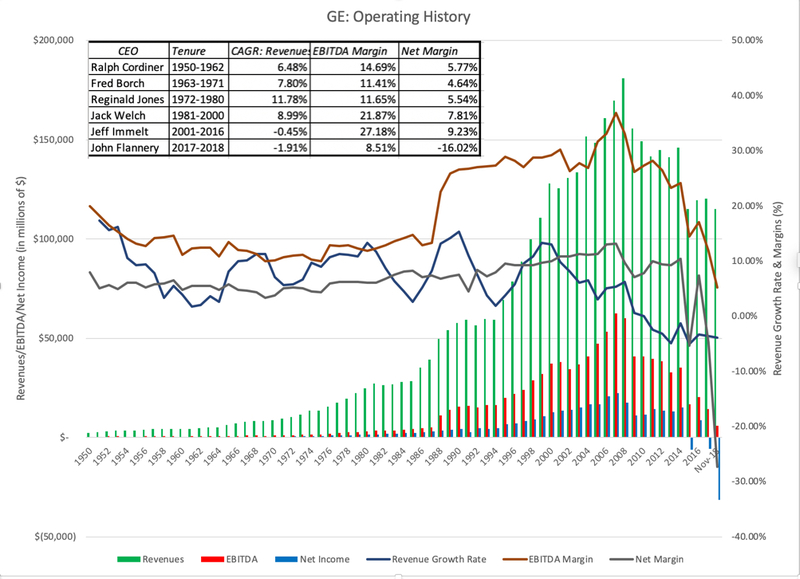 Reincarnate (or the Bataan Death March): There is a third option that GE shareholders have to hope and pray that GE does not take, where the company tries to recapture its old glory, throwing caution to the winds and reinvesting large amounts in new businesses, or worse still, large acquisitions. While there is no indication that Larry Culp, GE's new CEO, has grandiose plans for the company, that may be because the company is in crisis today. If as the crisis passes, Culp is tempted to make himself the second coming of Jack Welch, the company will follow the path of other aging companies that refuse to act their age, spending billions on cosmetic surgery (acquisitions) before finally capitulating. If there is a role model that Mr. Culp should follow, it is less that of Steve the Visionary, and more that of Larry the Liquidator. Conglomeration was, is and always will be a bad idea: I never understood the allure of conglomerates, even in their heyday. Only a corporate strategist could argue that combining companies in different businesses under one corporate umbrella, paying hefty premiums along the way to acquire these holdings, creates value, ignoring the logic that you and I as stockholders can create our own diversified and customized portfolios, without paying the same premium. If there is a lesson to learn from GE's fall from grace, it is that even the best conglomerates are built on foundations of sand. Note, though, that while this lesson may be learned for the moment, it will be forgotten soon, as are most other business lessons are, and we will surely repeat the cycle again in the future. Complexity has a cost: As I was going through GE's annual report, I was reminded again of why I have always described my vision of hell as having to value GE over and over and over again, for eternity. This company, through its actions and by design, made itself into one of the most complex companies in history, operating in dozens of businesses and across the world, with GE Capital acting as the cherry on the complexity cake, a gigantic financial service firm embedded in a large conglomerate. While that complexity served GE well in its glory days, allowing it to hide mistakes from sloppy acquisition practices and bets gone bad, it has bedeviled the company since 2008. Investors trying to navigate their way through the company's financials often give up and move on to easier prey. It may be too late for GE to do much about this problem, but as Asian companies rise in market capitalization, you are seeing new complex behemoths coming into play across the world. Easy money has a catch: I know that 20/20 hindsight is both easy and unfair, but GE's experiences with GE Capital bring home an age-old business truth that when a business looks like it can make you easy money, there is always a catch. Jack Welch initial foray into and subsequent expansion of GE Capital was built on the allure that it was a lot easier to make money in financial services than in manufacturing. From the perspective of having limited capital investment and growing quickly, that was true, but financial service firms through history have always had periods of plenty interspersed with bouts of gut-wrenching and intense pain, when borrowers start defaulting and capital markets freeze up. By making GE Capital such a big part of GE, Welch bet the farm on its continued success, and that bet went sour in 2008. The Savior CEO is a myth: I come to neither bury nor praise Jack Welch, but notwithstanding the fact that he has been gone almost two decades from the firm, GE remains the house that Jack built. Since Welch got the glory that came from GE's rise in the last twenty years of the last century, he deserves a portion of the blame for what has happened since. Don't get me wrong! Jack Welch was an inspirational top manager, a man with vision and drive, but he was also an imperial CEO, who made his board of directors a rubber stamp for his actions. As we look at a new generation of successful companies, this time in the technology space (the FANG stocks and the Chinese giants), with visionary founders at the top, it is worth remembering that power left unchecked in any person (no matter how smart and visionary) is dangerous. 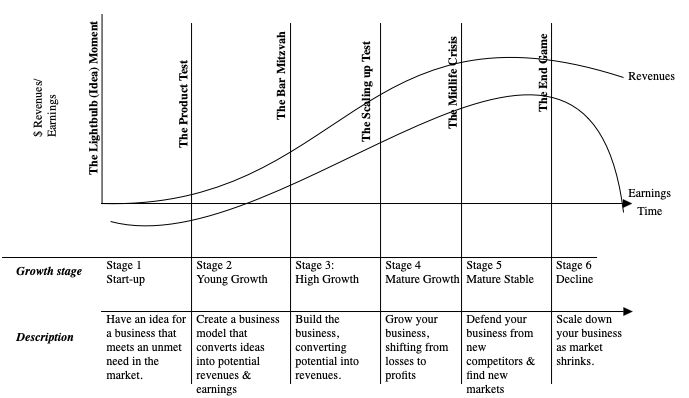 As many of you know, I believe that every valuation has to have a story. With some companies, like Amazon and Google, the story is uplifting and optimistic, and the valuations follow, but they still might not be good investments, since their prices may be even higher. My story for GE is not an upbeat one, but if it (and its management) acts its age, accepts that slower or no growth is what lies in the future and does not over reach, it is a good investment. I believe that the market has over corrected for GE's many faults, and at the current stock price, that it is significantly under valued. I will buy GE, but I will do so with open eyes, not expecting (or wanting) dividends to be paid until the debt gets paid down and the company exits the capital business with as much grace (and as few costs) as it can muster.